3 Best RV Water Pump Reviews 2019 (NEW Guide Inside)! Don’t Make The Same Mistake Others Do! Luckily For You We’ve Put Together An Easy Expert Step-by-Step Guide On Everything you NEED To Know Before Buying An RV Water Pump In Order To Avoid Future Problems For You & Your RV. WARNING: All RV water pumps should always be 12V – anything higher than that will cause problems for your RV! Luckily for you we’ve put together the 3 Best 12V RV Water Pumps For The Money! Shurflo keeps doing a great job at creating practical, powerful and reliable pumps. The 2088-544-144 is one that works just great with recreational vehicles. For high-flow and moderate pressure applications, it delivers a great performance. One very important aspect about this water pump is that it is easy to install in any position you like. Its design is small, convenient, and lightweight. This 12 V pump will practically fit on any standard RV space. You can then set it up in an either vertical or horizontal position. This pump, highly revered on Amazon, pumps 3.5 gallons per minute and delivers a pressure of 45 psi. What makes this offer even more fantastic is the competitive price. Another great aspect of the Shurflo pump is its low-maintenance design. You can rest assured that the pump will be delivering water at a constant flow while all you have to do is hook it up to your RV’s electrical system and water pipelines. Its NSF certification lists it as safe not only for bathing but also for preparing foods and drinking. It has a built-in 3-chamber diaphragm pump. The check valve allows for 1-way operation and prevents reverse flow. With this great pump, you got yourself a powerful and thermally protected permanent magnet motor. To ensure that the water stays potable and safe for consumption, the Shurflo 2088-554-144 pump uses Santoprene or polypropylene materials to keep the water up to the best standards. It is built with stainless steel and thermoplastic elastomer (TPE) to prolong the life of the pump. Given the background of a company like Shurflo and the amazing performance of the 2088, this pump can easily become the to-go whenever you need to get your water running smoothly. Once installed and ready to go in your RV, you will not need to worry about anything else but enjoying your clean water. A highly reliable pump and the guarantee of utmost performance from Shurflo will make you consider replacing your present pump with this robust one. Thermally protected and with a low-noise operation, the 3.0 Revolution will become one of your best companions while you are in your RV. 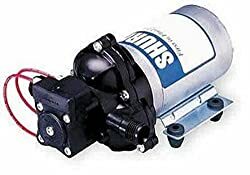 This Shurlo’s pump operates at 12 V, which is the ideal for an RV. A self-priming mechanism guarantees that you always have a fully-primed pumping condition. The pump also features a bypass low cycling. Its mechanism is so durable that this pump can go completely dry and still operate without suffering any damage. Other impressive features on this pump include its high-flow demand. It also has a very low-noise operation and zero rapid cycling. Of course, this versatile pump has a convenient weight and design to fit anywhere. You can easily install it and have it running in almost no time. It is a rather small 12V water pump that guarantees a continuous and steady flow of water of 3 gallons of water every minute. The pump operates at a pressure of 55 psi and under a 7 Amp current. With a check valve included you are guaranteed a steady 1-way flow. Shurflo offers this level of reliability to users so that you can rest assured that you will always have potable water for your shower and sinks. May you run into any problem, the company’s customer service is actually very helpful. You will probably notice that this model of water pump is cheaper than our first pump. This and its great performance make the 408-101-E65 one of your best choices to replace your old system. It is much quieter and with very little vibration. If you still want to dedicate a quality pump to your RV but do want to spend a little less, the Arterra is a great choice. This one innovates with the Power Drive Technology. It operates at 40 psi and 3 gallons per minute. Not bad at this low pressure, right? There are some other impressive features that make this RV pump one of our favorites. The self-priming technology is so effective that you can actually mount it to up to 6 feet and still get a constant flow of water. Along with its excellent performance, you find a compact and super practical design. This pump is built to live a long time with very little maintenance. Its four-chamber design helps keep the volume and pressure of water constant. Equipped with protection against overpressure and with thermal protection, the equipment is protected from damage. This pump requires very minimum maintenance but if you were to face any issue and need parts, this is a more-than-easy task as the design has the same footprint as other products in the same category. Just like with all pumps for RV, the Arterra PDSI-130-124E operate with 12V. If you are looking for a durable product that delivers optimal performance and at an affordable price, look no more. When you hold this one, you can immediately tell it has been carefully built with high-quality parts. The pump is quiet, although some might argue that it is actually a bit noisy. This might turn into something that taps into each other’s taste. If it is too noisy for you, you can always get yourself a silencing kit. So there you have it, plain and simple, the top-reviewed water pumps for your RV. Because you must put your satisfaction first, these ones will deliver effectively. You do not want to be on the shower in your RV all soaped up and then, UHOH, water stops! If you still feel on the fence on what your best option is, check out this easy guide. Because there is nothing better purchase than that one made from an educated decision. With time, you will become more familiar with what works best for you and your RV. So, here is what you need to consider when choosing your next RV fresh water pump. Fresh water pumps should not break the bank. However, don’t go too cheap as you might have to replace your pump fast. We made a selection based on your best budget so that we could narrow down your choices. Pumps that operate at 12 V are much better than those used by trucks and larger vehicles, which are 24V units. The 12V fresh water pumps are the ones typically used for recreational vehicles. They are specially engineered for this type of vehicle and come with standard operating motors. Regularly an RV needs water for the shower and water sink. So, you should be fine with this type. Now, you should still weigh in your options before going for the 12V unit. A 24V unit will have a greater pressure. They offer a reliable performance and are best for heavy tasks. In order to keep in at its best performance, you will need regular maintenance. If well maintained, it will last for a good time but it consumes a lot of power. Water pumps require energy to run. Consider the amount of power you have available when making your choice. Pumps that are not too efficient will quickly drain your electricity and will also add to your water bills. Once again, if you go for the 24V models, you will indeed need more electricity and you will be spending more water. Amperage is a very important number that you should be looking at. You can find this information on the product label or on the manufacturer’s site. If you do not have your product’s manual, look it up on the Internet with a quick search or call your manufacturer. The flow refers to the volume of water that a pump can deliver per unit time. In the case of water pumps, this is measured in gallons per minute. The minimum pressure you should be looking at is at the very least a flow of 1 gallon per minute (GPM). Many water pumps offer a flow of up to 3 GPM. This will depend on what your requirements are. Pressure is also important when determining the number of gallons that your equipment will pump. The pressure that a pump will exert will, in turn, be determined by its power capacity. Pressure is usually set at 30 psi, but to hold a greater flow, you will need a pump with a greater pressure. Many pumps have the option of adjusting the pressure. The good water pump models turn off automatically when there are no faucets open in your RV. When you first turn on the machine it will start pumping water until the preset pressure on the lines and pipes is reached. When this happens, it will automatically shut off. If it detects a drop in pressure due to you opening a faucet, it will start to operate again to compensate and provide a constant flow. We recommend you get a model with such auto switch. Manual on/off switch for a water pump is tricky. These pumps should be turned off before you close the faucet, in that order. Some units can be pretty loud when operating, so you want to find yourself one that has a quiet operation and minimum vibration. Finding the best pump for your RV will be a total success if you know what you are looking for exactly. But this not only involves knowing what you want in a water pump but also what the requirements of your recreational vehicle are. Before setting foot on the store or clicking on that link you should know the dimensions of the space where you be placing it. You should also know what is the pressure that your RV’s pipelines can withstand. How much water flow do you find acceptable for your potable water activities? Are you ok with 1 GPM or do you prefer to have more? How much are you willing to spend in terms of electricity and water consumption? Going through other users’ reviews to compare top rated products in the market also pays off. Good luck at finding the best fresh water pump for your RV. Don’t get clogged and make the best decision!